At this point of the game it is clear that the white groups on the left side and the black group in the top left corner died. White's urgent task is to survive at the bottom. The next major playing area is the right side. The problem of the life at the bottom is difficult and interesting at the same time. White has to live in most efficient way. Then how should Black invade on the right? The next diagram shows what happened in the game. Of course it is open to criticism. With 1 White seems to live at the bottom. I am not actually sure about the fact. At a looks better from the endgame point of view, but 1 makes pushing with 9 effective. Black 2 reduces White's influence on the right. Could it be deeper? It is very difficult to say. My impression is that it could. White 3 defends the corner. Black 4 tries to cut off White. It seems that 5 first was a better move. The threat to cut will be much more serious. White 5 defends territory and it seems that in a space of several moves all White's troubles are gone. It was too easy on White. 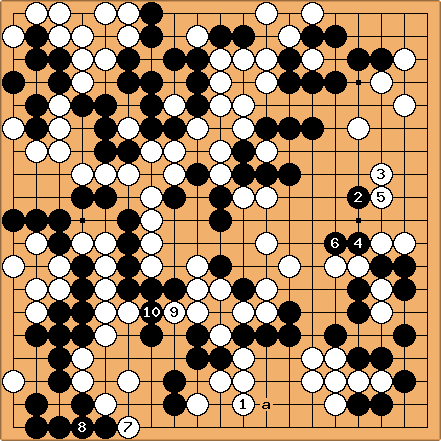 Black 6 threatens to capture two white stones. But White is more or less secure, and can start a counter-attack. White 7 is an obscure move. It is too difficult to read out what would happen if Black doesn't connect. Black submits to pressure and connects with 8. Now White has a possibility to capture some black stones. 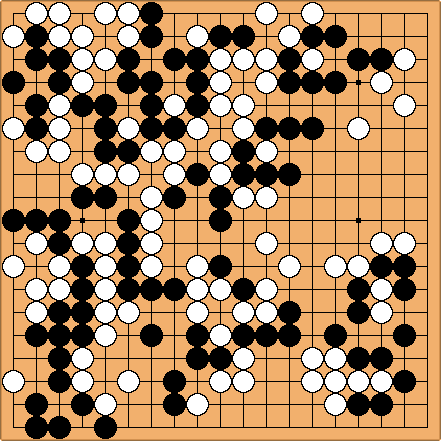 White 9 threatens to save a large groups of white stones and Black, naturally, connects with 10.